Do you know what your vehicle’s timing belt is, what it does, or where it is located? For many vehicle owners, the answer is no. It may surprise you to learn, then, that this is among the most critical items in your entire engine — and one that you will need to replace sooner or later. So we’ll give you a crash course — what the timing belt is, what happens when it fails, and when you know timing belt replacement is necessary. If you ever actually see your timing belt, you’ll notice that it does indeed look like a long, ribbed belt. It’s placed along the side of your engine, and its purpose is to keep the crank and camshafts timed properly. Or, to put it in the most basic terms, it keeps the top half of your engine synced up with the bottom half. Now, it’s worth noting that not all cars have timing belts. If your car goes back to the 1990s or earlier, it’s likely that you have a timing belt. Even some contemporary vehicles use timing belts. By and large, though, modern car makers use metal timing chains, which theoretically offer a longer lifespan — though this point is debatable. Anyway: If you don’t know whether you have a timing belt, you can consult your owner’s manual or perhaps just do a Google search. So that’s what the timing belt does — but what about the issue of timing belt replacement? The frequency with which you need to replace your timing belt varies from vehicle to vehicle, and you may hear different things from different manufacturers and mechanics. The conventional wisdom, though, is to replace the timing belt roughly every 60,000 miles, or every five years — whichever milestone you hit first. Over time, and due to simple wear and tear, the timing belt can snap – and when that happens, the consequences are potentially huge: On an interference engine, pistons can strike valves and do big-time damage to your engine. This doesn’t always happen, but it’s enough of a possibility that timing belt replacement should be an urgent priority. If you have some experience working on cars, you can probably replace the timing belt yourself. In fact, if you own a Nissan, you can consult your Nissan or Infiniti Factory Service Manual here! For those who are not quite so mechanically inclined, though, this is probably not recommended. The timing belt is too important to risk an improper installation. Alternatively, you can have it replaced at your dealership or at most any auto mechanic. This could run a few hundred dollars — but then, it will hopefully be something you only have to do every several years. 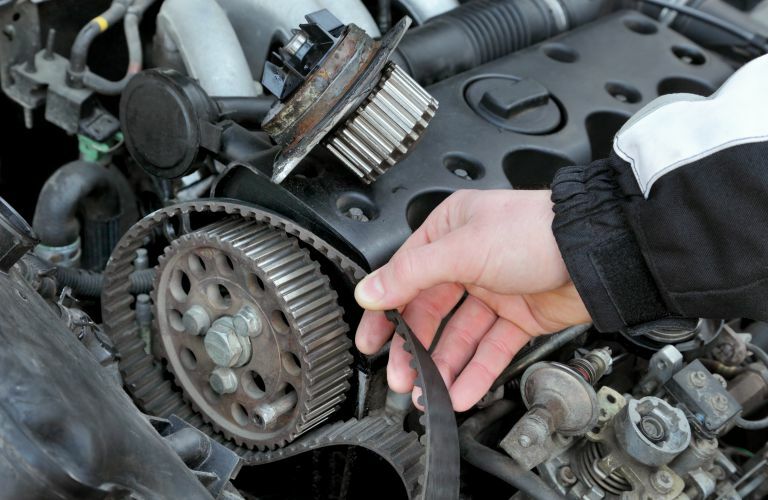 Above all, though, be aware of your timing belt — and don’t delay in replacing it when needed!